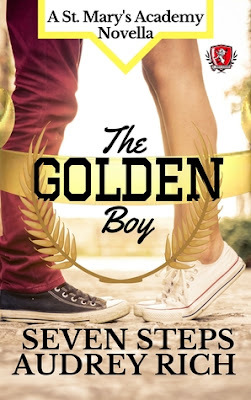 T's Stuff: Blog Tour The Golden Boy by Seven Steps & Audrey Rich! Blog Tour The Golden Boy by Seven Steps & Audrey Rich! Meg has it made. She has money to spare, attends an exclusive private school with the best film production program in the country, and, to top it off, she has a super-hot boyfriend. But when her father’s business goes under, and her boyfriend cheats on her with a ditzy cheerleader, the only way she can maintain her perfect life is to figure out a way to stay in school. When a fellow student offers to pay her tuition, Meg jumps at the chance. She only has to tell one tiny white lie to someone she’s never met. Until she discovers she must deceive Julius 'Hercules' Samson, the school quarterback with a heart of gold. Even worse, he's determined to sweep her off her feet. Can Meg go through with the plan to save her future, even if it means ruining Julius’? Inspired by Megera (Meg) from the story of Hercules, The Golden Boy is a poignant, emotional, young adult contemporary romance about a teen girl's hard choices, loss, and love. St. Mary's Academy is a young adult contemporary romance series that brings classic fairytale characters to life in a modern day, high school setting. It's filled with angsty heroines, hot heroes, and drama galore. St. Mary's Academy Shorts are shorter stories from within the St. Mary's Academy universe. Buy this book today because you've never read a fairytale quite like this. --William Shakespeare, Much Ado About Nothing. I have been writing for as long as I can remember. One of my mentors (you know who you are) often reminds me of my first foray into the world of literary fiction. It was a lively story about a bee's journey to find a pot of missing honey. He says that I have improved since then. I think that he's right. My favorite genres are Sweet Romance, Science Fiction, Dystopian and Historical. Audrey Rich is a New York City transplant living in South Florida, who writes sweet YA and NA Contemporary Romances and is an avid reader of novels where love conquers all. She’s married to her own happily-ever-after Hero, is an inactive CPA, and a stay-at-home mom homeschooling her teenage daughter, while also missing her son, who is away at college. Check out the FB party between the 22nd and 29th (https://www.facebook.com/events/159217834743644/), for more giveaways and prizes!